What's it about? Gemma Matthews lives on the Bryn Mawr estate with her mum and brother. Her dad is in prison. 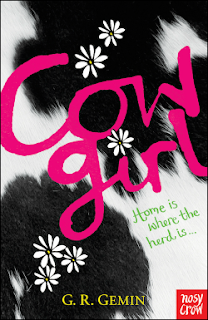 She starts talking to Cowgirl, aka Kate, who lives on a farm and whose dad is trying to get rid of their twelve dairy cows so that he can repay a debt. Gemma and Kate work together to move the cows down on to the estate. I didn't know what to expect from this book when I started it. Gemma is thirteen and entirely likeable. I also really really love the working class setting of the estate. We don't see enough working class protagonists in literature for children and young people. I also really liked Gemma's relationships with the people who matter to her - even though they're not always perfect, they are always real. Are any main characters people of colour? They're not main characters but the Banerjees are quite important to the story, and I liked them. Would I recommend the book? Yes, it's a very sweet middle grade book. Where is the book going now? Back to Lucinda when she's back in the country!